The smallest high-velocity spatter droplets occurred to some extent with most blows. They tended to occur ahead of the direction of the stroke and in front of the impact point, i.e. away from the person wielding the object. 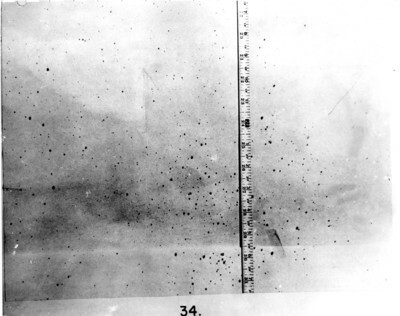 When the spatter included both high- and low-flying droplets, the higher flying included a much higher percentage of the small drops as shown by comparing high spots in photograph No. 33 with lower-flying spots from the same blows in photograph No. 34. These drops were formed by use of the flat surface of the ball-peen hammer. Drops were thrown as far as 12 feet from the origin and as high as 7 feet in the air at the point of impact. If the wall had not intervened, they would have traveled as far as about 20 feet.